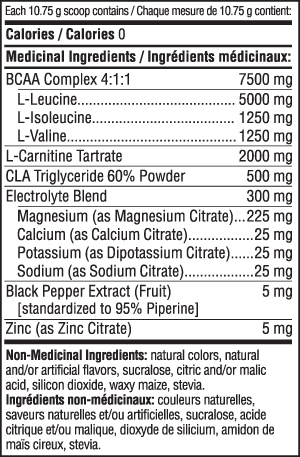 BCAAs are a powerful anti-catabolic agent during exercise. Amino Burn features a higher Leucine level to prevent muscle catabolism during physical activity. Carnitine is known to facilitate the transport of fatty acids into the cellular mitochondria to be used as energy. Amino Burn contains 2 grams of L-Carnitine Tartrate and 500mg of Conjugated Linoleic Acid (CLA) per serving to help promote fat metabolism. In order to maintain proper hydration during training, each scoop of Amino Burn contains 300mg of specific electrolytes. Bioperine® is an ingredient that has been scientifically proven to enhance the absorption of nutritional supplements and has thus been included in Amino Burn to maximize the effects of all its key components. Amino Burn has been formulated using natural flavors and colors exclusively. 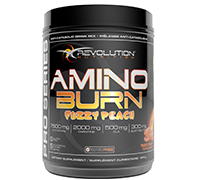 Amino Burn is part of Revolution Nutrition™’s exclusive Flavor Match system. This system allows you to mix and match your favorite Revolution Nutrition™ products together in the same shaker bottle according to the flavor of your choice! You can thus add Amino Burn to Pure BCAA, Bull Dose Rush, Whey Isolate Splash™, BCAA Splash™, Carnitine Cooler™, Whey Gainer Punch™, Whey Protein Punch™ and more! Mix 1 scoop (10.75 grams) of Amino Burn with 200 ml of water immediately before consumption. Sip throughout your workout or any physical activity.